I could hear the pendulum of the grandfather clock methodically counting time. I had been at her dining room table for an hour when I broke the silence. Our conversation had ebbed and flowed and ebbed again as I thought of and then exhausted discussion topics. Grandma was comfortable with silence. I had taken an Uber to her house after breakfast with a friend in downtown Denver. She answered the door and ushered me directly to a seat at the table just a few steps beyond the front entryway. My readiness to leave hung in the air. Her eyes were momentarily pleading. “Do you want to go get some lunch?” she asked. Recognizing that she didn’t want me to go, I immediately said I did. Only after I agreed did I wonder how we would get there. At 87, could grandma still safely drive? I hadn’t been in a car with her in years, and she often talked of how she drove less. A fleeting moment of worry crossed my mind as I remembered those calls. Quieting my apprehension, I lifted the locking mechanism on her gate and swung the wide chain link fence open. 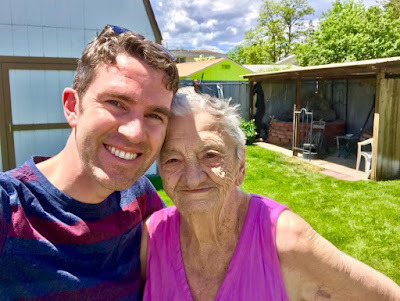 We climbed into her 2003 blue four-door Kia Rio, pulled out of the drive and accelerated down the street, paying modest attention to full stops at signs that requested them. I had no idea of our destination. Our mutual company was my lone concern. Her breakneck driving seemed directed by muscle memory. My stomach dropped as we dipped under a low hanging train trestle, then sailed around two tight bends. The first pulled me closer to her in the driver’s seat and the second quickly pushed me back against the passenger door. She turned into a Wendy’s parking lot, and slid into a handicap space. Opening her door, she slung her portable oxygen machine over her shoulder, and made a beeline for the restaurant with no attempt to lock the car. I followed suit, indulging in her rebel moment. “This is my grandson,” she answered by way of proclamation. My offer to buy lunch was swiftly refused. Grandma tersely spelled out her order’s requirements: extra butter for the baked potato and a packet of ranch dressing, too. Employees who knew her passed our table to make sure she had everything she needed. We ate with little conversation. Back at the house, she let the dog out in the yard to do his business. She wandered into her garden with a line of oxygen tubing trailing her path. At her pre-fabricated pond, she told me that her great-grandson recently said there were fish in it. She dismissed his claim, and kicked the stone pavers that wrapped around the plastic pool. I peered down at the shallow murky water in time to see a flurry of coy scatter among the ripples. I pulled her close to me and snapped a photo, part of our routine during my visits to Colorado. Now living on the east coast, my trips home were rare and time with family too brief. The few photographs we took over the years punctuated our more regular phone calls. When I finally left, my taxi pulled away and I glanced back to see her on the front porch watching. I had no inkling that would be the last time I would see her - my last living grandparent. In August, my paternal grandmother Beverly passed away. With her, another generation of my family tree faded to history. Born at home on March 21, 1931, Beverly was raised by her maternal grandmother, Eva Fagan, after her mother, Bernice, died when she was only six days old and her father, Robert, was unable to care for an infant. 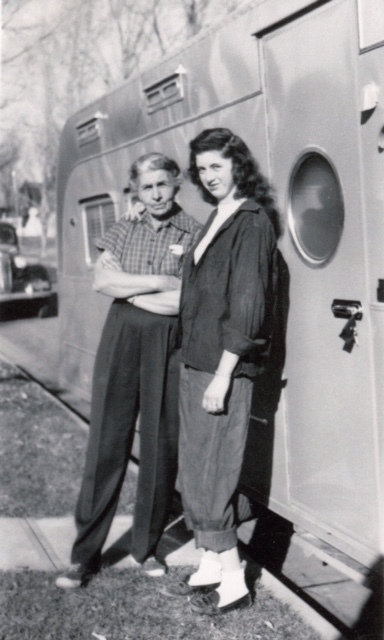 During the Great Depression, Beverly spent her early childhood living in a tent city while Eva’s husband, Thomas Fagan, worked on the construction of Hoover Dam. She grew up on a farm near Bennett and, later, Westminster, Colorado where the Fagans grew wheat, corn, and raised pigs and cows. During evenings on the farm, Eva sewed Beverly’s clothes and Thomas would play the piano. Beverly learned to knit and crochet, and even made scarves for the servicemen during World War II. She was a cowgirl who loved the freedom of riding her horse, Dusty, and often participated in rodeos in Westminster. Once, in a rare rebellious moment, she decided to play hooky and brazenly ride her horse in front of the school where she was promptly caught and reprimanded by the principal. Although not a fan of school, she excelled in math and would play chess with her geometry teacher. 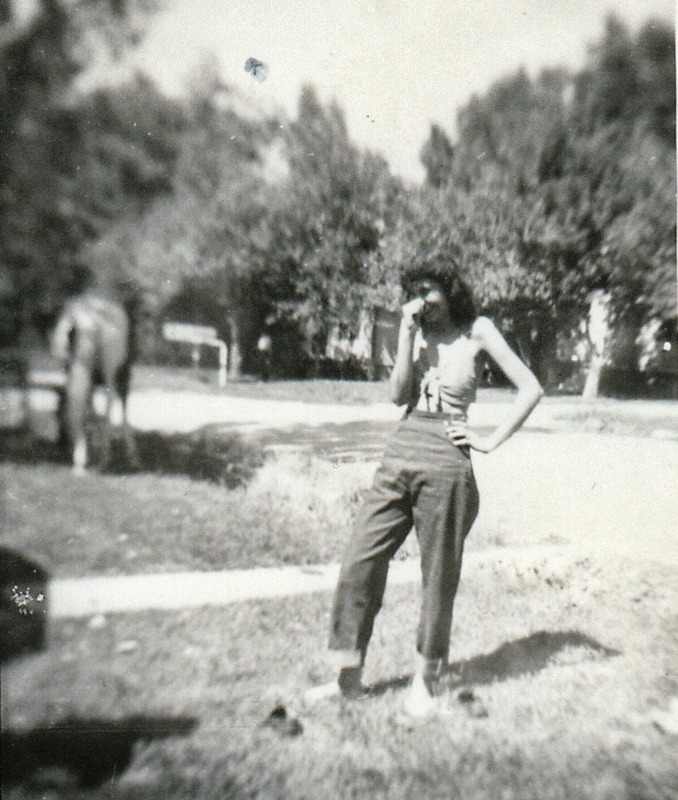 At 16, she landed her first job at Denver’s historic The Oriental Theater where she sold and collected tickets earning 35 cents an hour. She made a life-long career of teaching knitting, including at the May Department Store in downtown Denver, and later at the exclusive Daniels & Fisher Department Store located on 16th Street where the store’s landmark clock tower still stands today. Beverly enjoyed the outdoors and loved to camp, fish, water-ski, and snowmobile. She had a cabin in Florissant, Colorado where she enjoyed spending time in the mountains knitting apparel for her family while watching the deer and elk herds. Beverly was an avid gardener growing rose bushes, including one she still had from her grandmother. 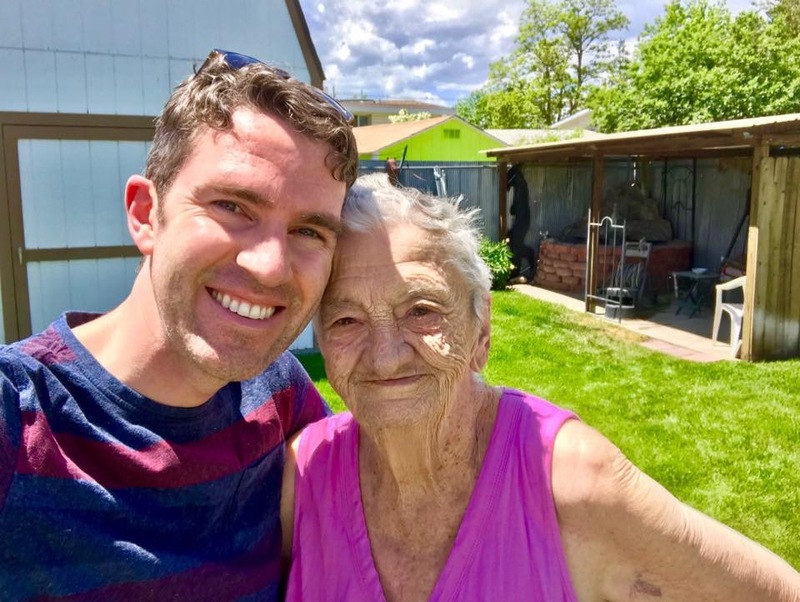 She also enjoyed the slot machines in Black Hawk, the camaraderie of friends early in the morning at McDonald’s, and quiet afternoons on her porch with the company of her dog, Little Bit. I am so sorry for your loss, Michael. You have brought her to life here, and your family history work will continue to do that. Cherish your memories. Thank you, Amy. 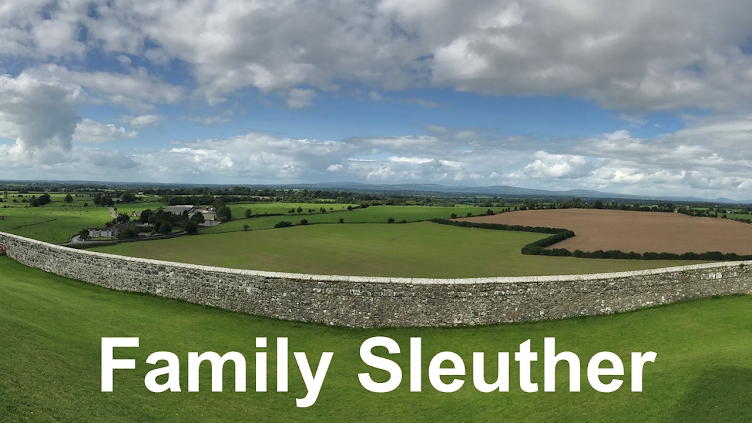 Another reason to underscore the value and importance of blogging our family history. Very nice memories and a tribute to your grandmother. Sorry about your grandma Michael. She looks familiar to me. I wonder of I see the famaliarity of a kindred spirit in knitting.....I look forward toeeting her in Knitting Heaven someday. Hugs to you cousin. Thank you, Stephanie. She definitely loved knitting very much, so you just may meet her one day in Knitting Heaven. Lovely blog post to read...albeit a sad topic. She sounds like a lovely lady. Thank you, Sandy. I appreciate your comment. I am so sorry for your loss. This was beautifully written. I laughed and teared up as I read your post. It is clear you loved each other. My husband and I lost our remaining 3 grandparents in the last few months of 2017. It is so hard to explain to people the odd emotion when the last of a generation passes. It really is an odd emotion to lose the last of a generation, isn't it? But it underscores the importance of recording/writing our remembrances, I think. Thank you for your condolences, Sierra. I appreciate it.